Join O.N.E. with Emma and Davyd Farrell as they speak about the power of plant dreaming and sacred earth activism. They will share with you how dreaming can inform your daily life and help you break through illusions to come to a better understanding of reality and therefore become a more whole person. Julie Morley will share Sacred Futures and what it means to envision our future in synergy with the sacred principles that regenerate this complex process, toward a better future for all beings. As humans begin to perceive that we are only one sentient species among many who participate in the complex creative process that we call nature, we begin to understand that how we participate means everything. Join O.N.E and Brooke Medicine Eagle as she shares about the wisdom of the Buffalo and the co-creative journey shared by the people, the land and the herd. At our home ranch, we have a powerful spiritual and ecological practice, initiated by the buffalo themselves in the form of sacred hunts. It is a deep teaching about wholeness, holiness, Oneness, AND how practical and sensible it is to act in harmony with All Our Relations. And this is only one of the sacred teachings the herd has offered as we have watched them transform and revitalize the land and create new springs in their 20 years of returning here. Given the scale and intensity of the issues we face, can an individual’s meditation and other pathways of cultivating fresh and creative perception really make a difference in our world? Join O.N.E., Felicia Kainat Norton and Charles Muinuddin Smith, Ph.D for a conversation about feeling into our sacred connection and how this can be a source for the transformation needed at this time. They will speak of our shared issues and how each of us can be a force for change by continually joining our inner cultivation with hope and Sacred Action. We are delighted to be hosting Mary Reynolds – Reformed Landscape Designer and Nature Activist, as part of our Sacred Earth Activism teleseminar series. Mary will be sharing her story of working-playing with the Wild. Within this she will be speaking about how we can all connect and co-create with our small treasures of Earth and local community spaces. The source of our activism is equally as important as the action itself. Although fear, anger, outrage etc. can certainly serve us at times, action initiating from our connection within nature is an effective and sustainable model for environmental change. Join O.N.E and Vision Council Member, Lauren Valle, as she shares about her experiences as an environmental activist in her 20’s and her evolutionary journey to become a Sacred Earth Activist. Lauren is a healer and community herbalist dedicated to bringing the healing powers of plant medicine and nature to her Cape Cod community. She is the founder of Kinship Herbal and Holistic Healing. Prior to founding Kinship she worked in the field of ecological engineering, working to build ecological wastewater and water remediation systems around the world based on the intelligent design of nature. She received a B.A. from Columbia University and during her college years and early twenties she worked as an environmental activist focused on issues of environmental justice, fossil fuel consumption and natural resource depletion. She has also lived and worked on two organic farms and has a longstanding interest in permaculture and whole system design. She is deeply committed to a mission of visioning and creating a healthy future for all through reconnecting to the earth and our biological heritage. 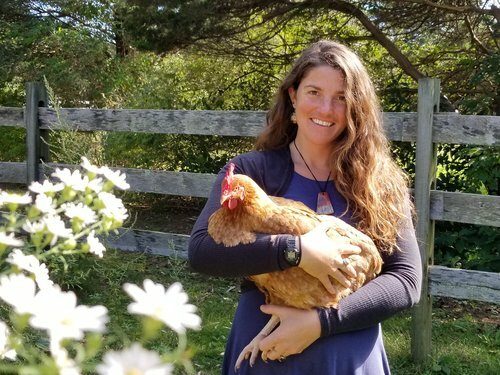 She currently lives on her homestead with her husband where they raise chickens, grow an abundance of good food and many of the medicinal herbs she uses her in practice.